Boryspil International Airport is the largest and the busiest airport in Ukraine. It provides over 67% of the passenger air traffic of Ukraine, handling over 10 million passengers per year. The Airport has two runways. The technical capacity of Boryspil airfield remains unique for Ukraine, CIS countries and the Eastern Europe. The runway 4, 000 m long and 60 m wide allows accommodation of all aircraft types 24/7 including under poor visibility conditions. Moreover, Boryspil is the only airport of Ukraine, from which scheduled transcontinental flights are operated. The Airport is a member of International Association “Airports Council International Europe” (ACI EUROPE); the Club of Quality Leaders of Ukraine; “Airports of Ukraine” Association of Civil Aviation (AAUCA); Kyiv Chamber of Commerce and Industry as well as Ukrainian Chamber of Commerce and Industry, Public “Ukrainian Association of Excellence and Quality”; Public «Ukrainian Air Transport Association», Association of Hotel Unions. Boryspil Airport is constantly working towards its improvement. We are developing infrastructure, attracting new airlines, enhancing service level, striving for the visit card of Ukraine to create the first absolutely positive impression on our country. Opened in 2012, the largest in Ukraine passenger Terminal D is the logical development of the Airport infrastructure, moving Boryspil to the completely deeper level of air traffic volume and quality. Boryspil International Airport is the base airport for Ukraine International Airlines. In the early 50s of the 20-th century the development of civil aviation in the Soviet Union was unfolding at extremely fast pace. Passing to the age of passenger jet aviation, opened by the soviet Tu-104 on 17 June 1955, required new approaches to the airports and runways construction. To comply with the safety regulations and overcome the restrictions, which existed for the airports located within the city, a project of common use of military airfield in the vicinity of Boryspil city was offered. After obtaining a permit for the civil aircraft to be based on the military airfield, preparation of the airport’s opening was conducted at a very fast pace. The works on the Airport opening were performing 24/7. Order No.265 On the Airport Foundation was signed by the Head of the Civil Air Fleet Central Office on 30 June 1959. The first flight was handled on 7 July 1959. During the first year of its operation, which was initially carried out afield (six tents), and later on in temporary facilities, Boryspil Airport managed to rank 3-rd in terms of passenger traffic among the airports of Ukraine (yielding to Simferopol and Zhulyany Airports only). Since 1960 Boryspil has started handling international flights. The Air Terminal design was already developed in 1961 by KyivProject Institute. In 1965 the facility was inaugurated and commenced. The capacity by then standards amounted to 1, 400 passengers for domestic and 200 for international flights. The Air Terminal was the second largest, yielding to Moscow Domodedovo only, as well as one of the largest in Europe. Passenger traffic increased annually. It caused the necessity of the second runway construction, which was opened in 1971. Apart from that, radio and electronic workshops, laboratory building of ATB, emergency and rescue station, secondary radar equipment system etc. were constructed. In 1982 the construction of Strila automated air traffic control center in Ukraine was set up. The system facilitated air traffic controllers’ and crew members’ job significantly and covered practically all territory of Ukraine. Till 1990 Boryspil Airport had the best performance among the Ukrainian airports. The crisis caused by the Soviet Union demise could not but influence the airport operation. Hence, the enterprise was not closed but started seeking investors. The Cabinet of Ministers of Ukraine issued a rule of historic importance on the reconstruction of Boryspil Airport. The rule stipulated that 60% of funds would be invited from the investing firms. It gave a new stimulus for the enterprise development: on 11 March 1993 Boryspil Airport was granted State International Airport status. On 1 April 1993 the second legal foundation of Boryspil Airport took place. According to the Order of the Minister of Transport of Ukraine, Boryspil State International Airport as a legal entity, as well as Ukrainian Airlines regional central office and Kyivcenteraero enterprise were established onsite Boryspil Aviation Enterprise. In 1995 Terminal C for VIP passengers handling was opened. In 1998 the Сouncil President of ICAO (International Civil Aviation) Dr. Assad Kotaite officially confirmed the status of the Airport training center as ICAO Aviation Security Training Center (currently this Airport department is one of 21 similar centers located worldwide). To mark the 10-th anniversary of Ukrainian Independence, Runway-1 had been reconstructed. The funds were invited from the European Bank for Reconstruction and Development. By the way, it was the first loan of EBRD for Ukraine. The previous runway, designed for the liners with 47 tons weight can now handle any types of aircraft, even future. Runway-1 complies with the ICAO requirements of III A category. On 21 September 2010 a new Terminal F was put into operation, with the capacity 900 passengers for departure and 900 for arrival per hour. The enterprise development does not end here. On 28 May 2012 the largest in Ukraine passenger Terminal D with the capacity 3, 000 passengers for departure and 3, 000 for arrival was opened. 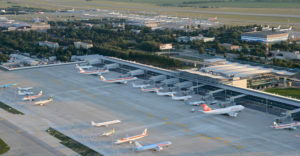 During Euro 2012, on the day of the final match in Kyiv, Boryspil Airport set a new record, having handled 630 flights. The total number of passengers, who used the airport services that day amounted to 39, 317 people (the previous record was set in 2008 – the Airport then handled 423 flights). We are sure that in future Boryspil Airport will still remain the flagman of the Ukrainian aviation infrastructure and reserve the positions of the Eastern Europe leading air hub.